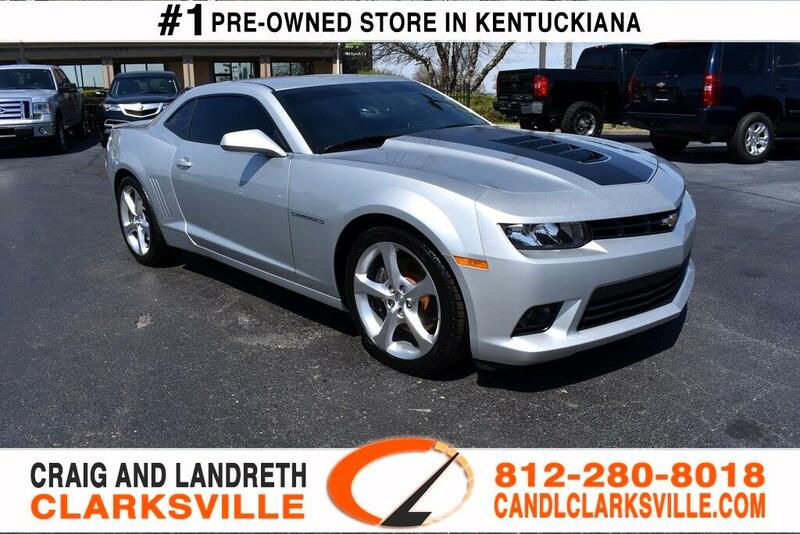 CERTIFIED BY CARFAX - NO ACCIDENTS 2015 CHEVROLET CAMARO SS 1SS ** ONLY 26,000 MILES ** COMES WITH A GREAT PREVIOUS OWNER AND THE SERVICE RECORDS ARE IMPECCABLE ** 6-SPEED MANUAL ** TOUCHSCREEN DISPLAY ** NAVIGATION ** BLUETOOTH ** PREMIUM WHEEL PACKAGE ** SUPER CLEAN CARFAX ** NON SMOKER VEHICLE ** YOU WILL NOT BE DISAPPOINTED WITH ANYTHING ON THIS VEHICLE! ANY QUESTIONS CALL RICHARD SPAN, JAKE SMITH, OR JIMMY SMITH JR AT 812-280-8018!! WE'VE NEVER LOST A DEAL WHEN IT CAME TO PRICE OR QUALITY!! Fresh oil change, White glove detailed, 110 point safety inspection, Bluetooth, USB, Keyless Entry, Rear View Camera/ Backup Camera, Satellite Radio/ Sirius XM, Parking Sensors, Parking Assist, Sport Package, Non-Smoker, Lots Of Options, Certified. Certified by CarFax., Preferred Equipment Group 1SS. Odometer is 2507 miles below market average!